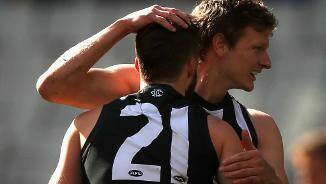 Three Collingwood players of varying age and experience have re-signed with the club for 2018 and beyond. After struggling to make the cut at representative teams early in his football journey, Phillips flipped the script and finished his time at the Oakleigh Chargers as a dual premiership player. Two years later he had established an AFL career and added 24 senior games to a growing resume. The 187cm Victorian can play in a range of positions on the ground and is known for his elite running and ability to win disposals at will. No case of second-year blues for Tom Phillips as the wingman played 18 of 22 home and away games. An elite athlete, the former Oakleigh Charger spent his off-season running in India, before impressing upon return to the club in October. He was rewarded with a senior game in round one, and played all but one game until a round 15 clash with Essendon. 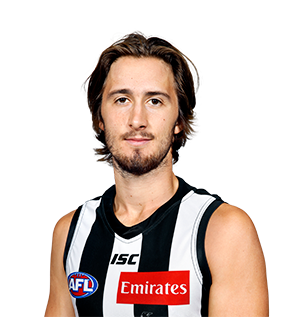 Collingwood fans may be familiar with Phillips’ potential, but he received league-wide recognition in 2017 as the round nine AFL Rising Star nominee. The former Oakleigh Charger had 24 disposals in a win over Hawthorn, with the nomination reflecting a string of solid performances at senior level. Phillips was one of eight young players recognised at the end-of-season vote count, polling behind eventual winner Andrew McGrath (Essendon). 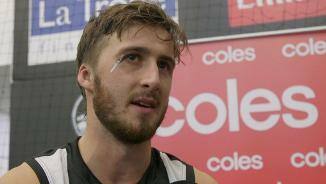 Phillips' emergence as a Magpie came on a warm November morning when the brand new recruit edged out Steele Sidebottom to win Collingwood's pre-season time trial at the Holden Centre. Strong form on the track led to impressive VFL performances, notably a 33-touch game in round nine against Werribee. It was enough for Collingwood's coaches to reward Phillips with an AFL debut, coming on the big stage of a Queens Birthday clash against Melbourne. The 20-year-old had 15 disposals on debut and kicked his first goal a week later before returning to the VFL later in the season. If Phillips can translate his best form into consistent performances, improvement should be expected in 2017 and beyond. After 12 games and a premiership for Oakleigh in 2014, Phillips returned to the Chargers in 2015 as an over-age player determined to make the most of his final year in the highly-touted development league. The 19-year-old was at the forefront as Oakleigh worked their way towards what promised to be another season that would extend deep into September. He kicked 23 goals in 16 games, while he was also named amongst the best players on eight occasions. 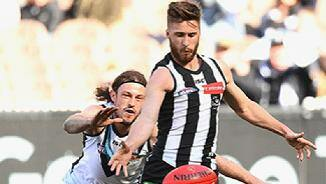 It was the middle of the season where Phillips entered a remarkable run of form and arguably caught the eyes of AFL recruiters. In six games between rounds five and 15 of the TAC Cup season he averaged 34 disposals a game. He went on to become a premiership player, with 18 disposals and two goals in Oakleigh’s 12-point victory over the Eastern Rangers.